When Esmaré Weideman became an intern journalist at Die Burger newspaper in 1984, it was because, as she puts it, in her "student arrogance", she wanted to change the world. At the end of the month, she will leave the same company as its chief executive officer (CEO), having maybe done just that. 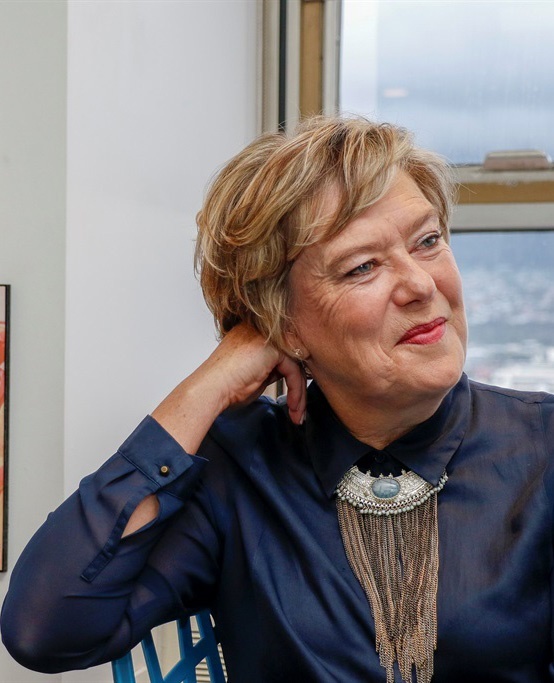 "I really do still believe journalists change the world," she says during our interview in her office on the 21st floor of the Media24 Centre in Cape Town. "Yes, through our investigative journalism, but also through telling the stories of ordinary people. "You know, I still call myself a journalist. After all these years, I still think of myself as a journalist, not as a businesswoman." Weideman, 56, is the iron fist in the velvet glove who has been running South Africa's biggest media company for the past eight years. She retires after 33 years in the business, leaving behind a company with interests in digital media and services, newspapers, magazines, e-commerce, book publishing, printing and distribution. However, it is Media24's editorial independence, and the gusto that it has created among its journalists and editors, that she is most proud of. "Editorial independence really is sacrosanct in this company. And it wasn't always like that. I'm on record saying we are not proud of our past. But the thing to be proud about is how we turned it around," she says. "I think it is probably our biggest treasure and we need to protect it at all costs. The former editor of Huisgenoot/You/Drum adds that to run a media company there is constant pressure from people who want to be portrayed in a certain way. "You really need to have a backbone and stand up for your editors and say: 'This is not the office to call if you want to complain about editorial content.' I think the journalists and the editors know that as well." Globally, the media is just coming out of a decade of major disruption, with traditional media houses forced to move into the world of digital publishing. Media24 has managed to weather the storm by strategically prioritising its digital publications and diversifying its business into the e-commerce space. Today, the company's media titles reach six out of 10 South Africans, something that Weideman is only too aware comes with a lot of responsibility. With Facebook and Google taking more than 80% of the local digital advertising revenue, that makes producing quality journalism at a profit all the more difficult. "To have a stable democracy, the role of an independent media is hugely important. As we have seen, we play a huge role in terms of the socio-political landscape. To thrive in business, you need a stable economy and for a stable economy, you need a stable socio-political landscape," Weideman explains. "Maybe it's our role as media companies to also educate business about this, but it is as much in their interest and their responsibility to invest in media to ensure that we have a stable society." However, she is not about to suggest that media companies start asking for charity. Instead, she is convinced that journalism can be profitable if you have the right people on the right seats of the bus. The way to do it is to take the excellent content that's being produced and distribute it in the best possible ways determined by engineers, so that people can access it where and how they want. That's why 24.com, the digital publishing arm of Media24, currently employs almost as many product managers and engineers as it does journalists. "I think we produce excellent journalism. Our print media products are comparable with the best in the world. On the digital side, if I look at where News24 was eight years ago and where it is now, it is an infinitely better product than it used to be. I'm very proud of the transition of News24." While Weideman can, in many ways, be regarded a trailblazer for women, especially in the media, she is reluctant to accept such an accolade. "I think it's incredibly important to have role models in a society, and if I was a role model for young women anywhere, I accept that with gratitude and humility," she says. "I would hope that gender equality has become such a norm that it really shouldn't be an issue anywhere. In my own career, I don't think I was ever given any kind of a job because I was a woman. It would have been an insult to me. But having said that, I know through interaction with many women that for them it is meaningful. So, therefore I just accept it with humility." What will she do now that she finally has time for herself? It's one of those airport goodbyes, she says, as she won't be going too far. She will continue to work with Media24 in a consulting capacity. The rest of the time, she will spend with family and friends, reading the long list of books for which she hasn't had time and, of course, the news.